101 essays on great moments in neglected films and neglected moments in great films from Nell Minow, who reviews each week’s releases for Beliefnet and radio stations across the country as “The Movie Mom.” From the lobster scene in “Annie Hall” to the final moments of “Godfather 2,” to a sandwich in the otherwise forgettable “Wives and Lovers” and the “Coward’s Corner” scene in “Homicidal” and the garbage can lid dance in “It’s Always Fair Weather,” and the “Dead by Third Act” character in “Top Gun,” each illuminates an element of cinematic storytelling that will make you understand and appreciate all movies better. I am a movie fan and enjoy a good one. 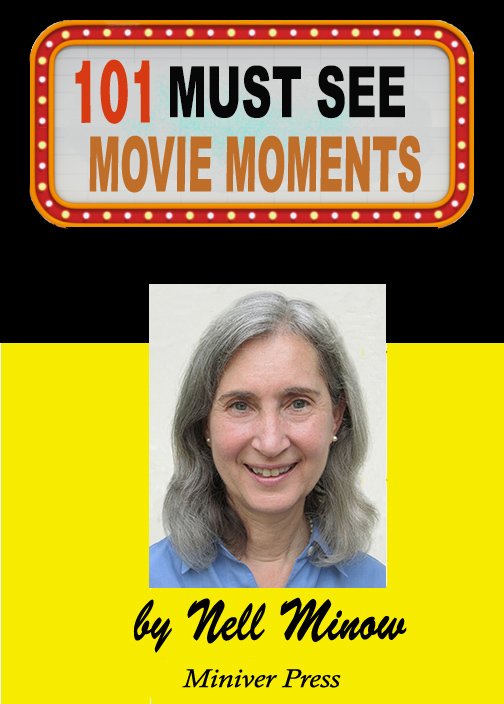 Nell Minow’s book Movie Mom: 101 Must-See Movie Moments is sure to be a classic. This book is the perfect resource for any person who likes to get a grasp of many interesting facts in a short period of time, sure to become an expert of movie trivia. What I most liked about this book is that it exposed me to many older films that I had either never heard of or knew the name but did not know what it was about. Of course, many of the contemporary ones I had viewed. Minow did an excellent job of weaving also similar plots or stories into the written dialogue. The memorable lines and synopsis format makes for a quick read or a handy reference. Not only have I been able to learn about 101 movies, it has set me on an odyssey to experience them all. I give the book a thumbs up. I downloaded this when it was free on the Kindle Fire for a brief moment, but I want to make it absolutely clear: after having read it, it is well worth the purchase, and you should not hesitate to do so. Each small write up is only a few pages at most, and you can quickly and easily read a handful here and there. At some points I would read a section or two in a few days and other times I would sit down and go through 30 or so pages. Each write up brought back fond memories of the films I have seen, and when I read something outstanding about a film I have yet to see, I added it to my list of movies to watch and will eventually get to. Nell Minow clearly writes as a true fan of film that is sitting with you at a table just ‘hanging out’ and discussing things, and for a book like this, it works wonderfully. Again, if you consider yourself even a small fan of films, this is a must buy and worth every penny.